Windstorm Mitigation Inspection is the only inspection that is almost always going to result in some level of insurance discount on your insurance policy premium. A Windstorm Mitigation Inspection is for homeowners that are trying to reduce their Home Insurance rates up to 50% off the original policy premium. If your home has undergone a Windstorm Mitigation Inspection you are potentially eligible for insurance discounts or credits from insurance companies. Insurance companies increase their odds of insuring more secure, less damage-susceptible properties in targeted areas. Have you had your Windstorm Mitigation Inspection on your home yet? If you have not had a Windstorm Mitigation Inspection on your home, chances are you are paying too much for your windstorm insurance! 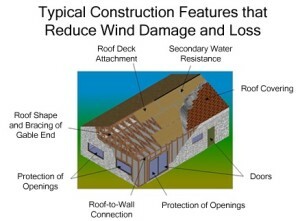 Having your Windstorm Mitigation Inspection today on your home could translate to savings and give you a peace of mind. During severe windstorms, such as hurricanes, homes are tattered by rain and heavy winds. Wind mitigation specifically targets the structural and nonstructural aspects that prevent or lessen damage caused by high winds that occur with storms. Windstorm Mitigation Inspections are common in South Florida. A certified Home Inspector will come out and report on the key features that may decrease the amount of damage your home suffers during a hurricane or strong windstorm. If you live in areas prone to these natural disasters, then it is very important to know the ins and outs of Windstorm Mitigation Inspection. A Windstorm Mitigation Inspection can help look for construction features that will reduce losses in hurricanes, such as concrete block construction, shutter and opening protection, roof to wall attachments gable end bracing, hip roofs and hurricane clips. Cris Home Inspections will look into the advantages of a Windstorm Mitigation Inspection – how it can help you save money. Wind Mitigation Inspection is necessary for old homes and new ones alike. Your home structure undergoes an Inspection to make sure it is in sound condition. This Home Inspection will determine the physical features of the home (roof, siding, windows and doors) and systems such as plumbing, heating, cooling and electrical systems. If you seek, the services of our professional Windstorm Mitigation Inspectors then maintenance issues or minor discrepancies are repairable. Remember, there is no home that is flawless. If you live in Palm Beach County and your home was built on or after January 1st, 2012 – you are eligible for minimum FBC 2001 credit. FBC (Florida Building Code) new roof discount in Palm Beach County has to be newer then 3/01/02. In Broward County, it has to be newer than 9/01/94. If you live in Broward/Miami-Dade and your home was built after 1996, you are eligible for an opening protection class C credit. If your home was built after 2002 or later you are eligible for opening protection class A credit. Age of the Home – Year the Home was built. Roof Covering – When was the roof installed and does it meet South Florida building codes. Roof Deck Attachment – What type of roof decking is used and how it is attached to the underlying structure. Roof to Wall Attachment – How the rafters/trusses are attached to the wall top plate. Opening Protection for Doors & Windows – Shutters or impact resistant coverings or products.